The Muhle **is sold! ** 21mm in faux Tortoise. $47 SOLD!! Shipped USA and Canada. Overseas might be a bit extra. 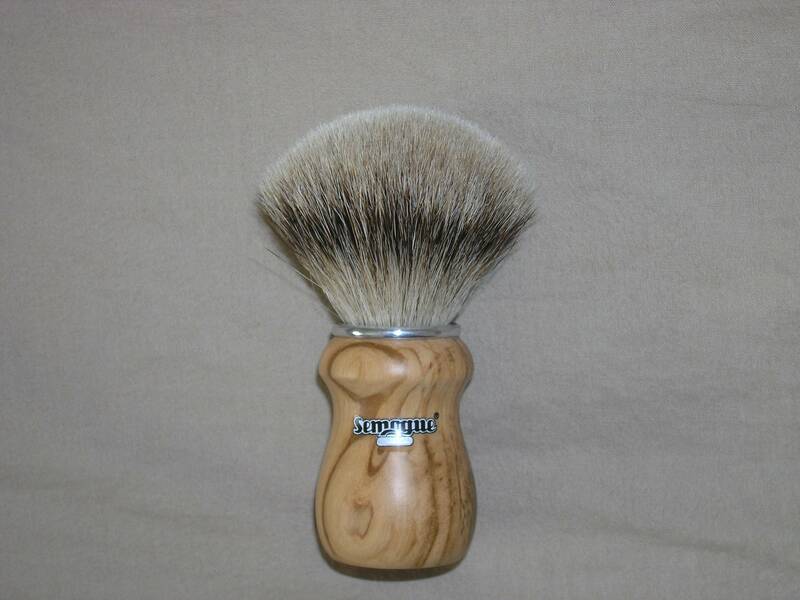 The next brush being sold by me today is The Semogue SE 2013 24mm with the Selected Silvertip hair. Wonderfully soft tips and densely packed with a nice low loft. This brush, to me, is an ideal face lathering brush. I however use a scuttle exclusively at home and so like my longer handled longer lofted brushes. As you can see, the Olive wood has a beautiful grain to it and it is in almost new condition since I only used it twice on my face after two test lathers with shave soap to get rid of the usual badger funk. If you like to face lather, you owe it to you yourself to try this brush. 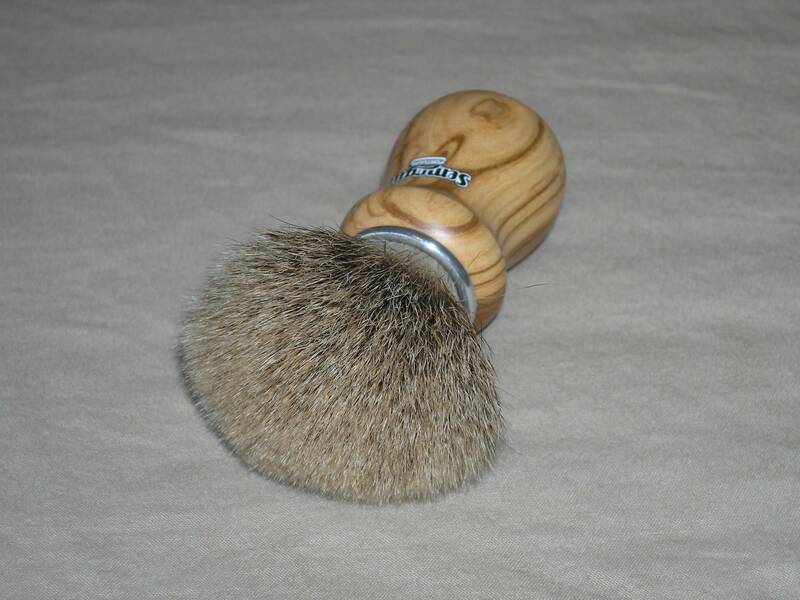 The Semogue Special Edition 2013 brush is finally here. This brush is densely stuffed with the very best Selected Silvertip Badger hair, a whiter and softer kind of Silvertip hair to provide the ultimate shaving experience using either soaps or creams. The manufacturing of the knot was successfully achieved after intense testing to make sure it provides the optimum balance between backbone and luxurious softness. The knot is 24mm in diameter and 52mm tall. Besides having the rare Selected Silvertip Badger hair, we made a beautiful olive wood handle just for this model. The new silver sticker shows the new Semogue logo and below the word "Portugal". The engraving in the base shows the special edition information with the production year and the handle material. This brush feels really luxurious in the face. It lathers easily any hard soap or cream. In terms of comparison to other production brushes, I'd say that it feels like a Simpson Chubby between the 1 and 2 model and the hair resembles a lot the Shavemac D01 silvertip hair. So far i have not tried anything more luxerious than this or the newer softer 2-band texugo brushes. This is wonderfully soft, and the only other thing i've used since i've gotten them is the Rubberset 400 I found in the wild. Between this knot and the 2-band I don't have any residual SBAD, and I had it bad! Now I have an equal share of RAD and FIW-AD. You now, Found in wild-acquisition Disorder. I have owned this same Muhle synthetic for quite a while now. It's an excellent brush and a solid performer for travel. Bump for reduced price on Semogue. Bump for final price reduction on Semogue 2013.
archived! Congratulations to seller and buyer, and thank you for using TSN!